When lions reproduce, males in the pride simply copulate with any female lions in heat. Males often guard their mating partners until her estrus cycle is finished and fight with other males that try to approach her; however, unguarded females often mate with other males while they are in heat. Female lions can go into heat throughout the year. Their estrus cycle lasts for 4 days. When they go into heat, they become restless and often roll on their backs. Males can also sense females in heat by smelling their urine. Both males and females initiate mating. When lions mate, the male lion mounts the female and bites her neck to make her passive. 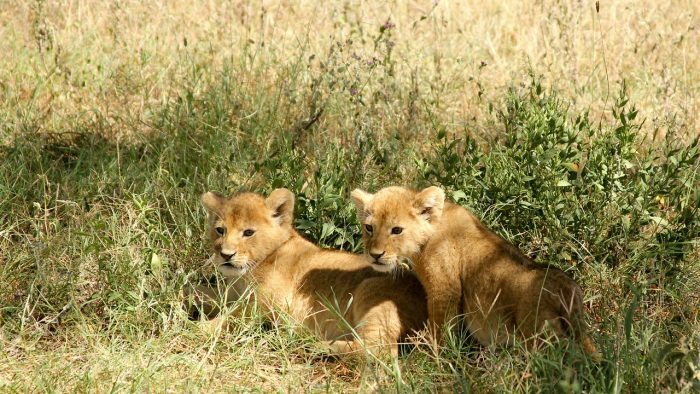 After successfully mating, cubs gestate for an average of 110 days. A female can give birth to up to four cubs at one time.